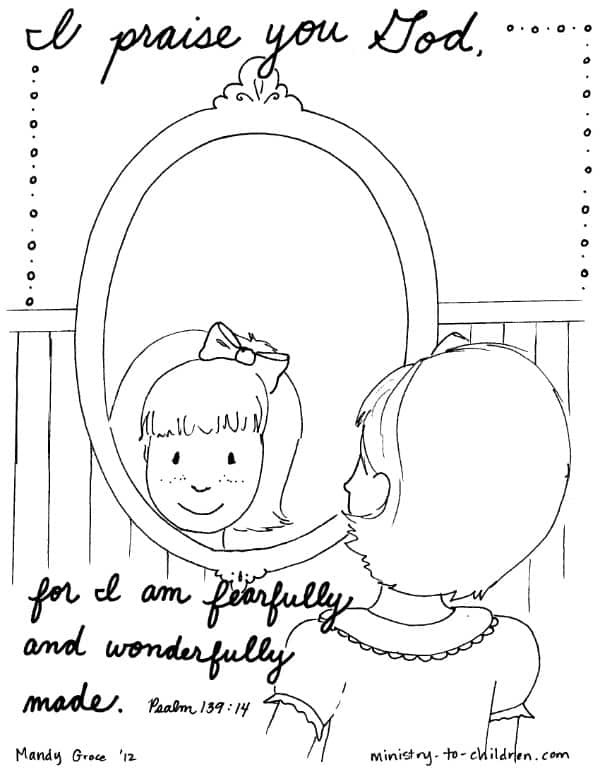 Psalm 139 Bible Coloring Page "I am fearfully made"
Click above to download this free coloring page on Psalm 139. This free coloring sheet was inspired by Psalm 139:14. It’s a prayer giving God glory for his wonderful work of creation. The illustration shows a girl looking into a mirror. The text of the Bible verse is written on the page. You can also download the boy version of this same verse. To download this printable as a PDF document, click on the preview image to the right. We’ve also uploaded the file in JPEG format for any advanced users who would like to edit the words or text. This is just one of Many’s free coloring pages based on memory verses for children. Like all our Bible coloring pages, these are 100% green for you to download and use in your ministry. We love to hear back from readers about how they are using these materials in their ministry, home, or school. Simply leave a comment below. It will be a great encouragement to our writers and your creative ideas will help other readers. Tony Kummer (Editor) reviewed & updated this page on : October 9, 2012 at 9:27 am. All our content is peer reviewed by our readers, simply leave a comment on any post suggest an update.